The South Central Membrane Association (SCMA) is in the process of developing the program for its Annual Conference which will be in Fort Worth, TX on August 21-23, 2019 at the Hilton Fort Worth. The conference theme will focus on membrane technology, treatment, techniques and trouble-shooting. 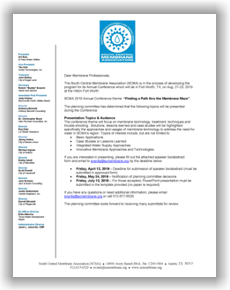 Solutions, lessons learned and case studies will be highlighted specifically the approaches and usages of membrane technology to address the need for water in SCMA’s region. 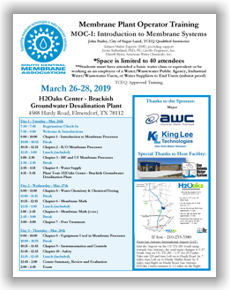 If you are interested in presenting, please complete the online form or complete the PDF fill-in form and email to events@scmembrane.org by the deadline listed below. If you have any questions or need additional information, please email events@scmembrane.org or call 512-617-6529.